Unassembled enclosure option (42U x 600mmW x 1060mmD) for unique sites - Not all installation sites have space clearance required to move and install standard height enclosures. This unassembled option is packaged for transport through narrow spaces and assembly at the installation site. Universal IT enclosure provided with no side panels for spaces that require less security at the rack or will be paired with other enclosures to form a row and position side panels only at the row ends. The enclosure is for low to medium density server and networking applications. Compact width to optimize data center space. 42U height to easily roll through doorways. Universal IT enclosure for low to medium density server and networking applications. Compact width to optimize data center space. 42U height to easily roll through doorways. 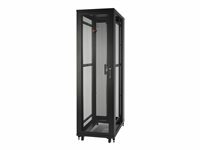 Tall Universal IT enclosure with 48U spaces for environments that can take advantage of higher spaces and provide more mounting u-spaces at each enclosure footprint. Compact width to optimize data center space. For low to medium density server and networking applications. 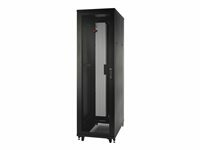 Deep and Tall Universal IT Enclosure for low to medium density server and networking applications that either require additional equipment clearance space or more open space for ease of access in the rear of the enclosure. Tall to provide 48U spaces for environments that can take advantage of higher spaces and provide more mounting u-spaces at each enclosure footprint. Compact width to optimize data center space.